The large area imaging detector WIDEPIX®1×5 with resolution of 1280×256 pixels (0.3 Mpixels) and continuously sensitive surface is composed of a row of sensitive detector tiles. Each tile consists of single Timepix hybrid detector (256 x 256 pixels) with edgeless silicon sensor. 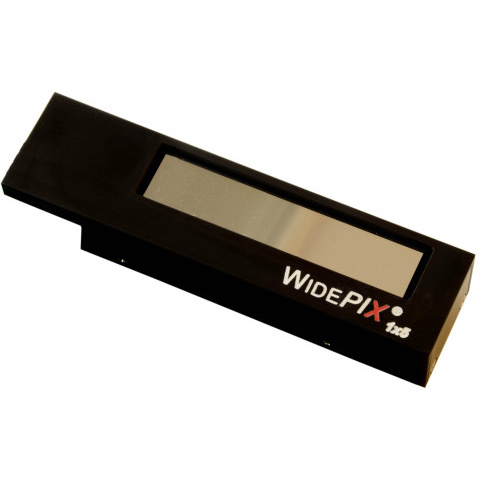 Thus the whole area of the WIDEPIX® device is fully sensitive. Each pixel has integrated digital counter which counts number of particles (e.g. X-ray photons). This particle counting principle assures noiseless detection and no added noise (integration and readout noise is zero). The noiseless detection allows getting images with very high contrast and broad dynamic range (theoretically unlimited). Therefore even low mass objects (e.g. plastic or soft tissue) are imaged with high contrast. The arrangement of tiles in row is very advantageous for scanning of larger objects or for CT scanners where some parts of rotating object can leave field of view. The camera is connected to the controlling computer via FITPix 2 interface and USB 2.0 cable. The readout time is 50 ms per frame resulting in 20 frames per second.